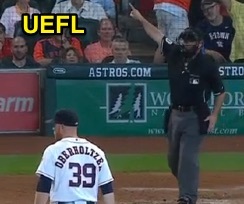 HP Umpire Rob Drake ejected Astros P Brett Oberholtzer for throwing at Yankees batter Alex Rodriguez in the top of the 2nd inning of the Yankees-Astros game. With one out and one on, Oberholtzer surrendered a home run to Yankees batter Chris Young. Immediately thereafter, subsequent batter Rodriguez took a first-pitch fastball inside for a called first ball. Replays indicate the pitch was significantly inside (px -2.580, or nearly two feet [22.5 inches] from the inner edge of home plate), the call was irrecusable. At the time of the ejection, the Yankees were leading, 6-0. The Yankees ultimately won the contest, 9-6. This is Rob Drake (30)'s third ejection of 2015. Rob Drake now has 11 points in the UEFL Standings (9 Previous + 2 MLB + 0 Irrecusable = 11). Crew Chief Joe West now has 15 points in Crew Division (14 Previous + 1 Irrecusable Call = 15). This is the 109th ejection of the 2015 MLB Regular Season. This is the 50th player ejection of 2015. Prior to ejection, Oberholtzer's line was 1.1 IP, 6 ER (2 HR). This is the Astros' 3rd ejection of 2015, 2nd in the AL West (SEA 4; HOU 3; LAA, OAK, TEX 2). This is Brett Oberholtzer's first career MLB ejection. This is Rob Drake's first ejection since May 13, 2015 (Bryce Harper/Matt Williams; QOC = Y [Check Swing]).